In general, the more dramatic and disruptive the action, the fewer people you need to make an impact. But the large demonstration on the mall in Washington, DC* is such a staple of American politics that large numbers matter. 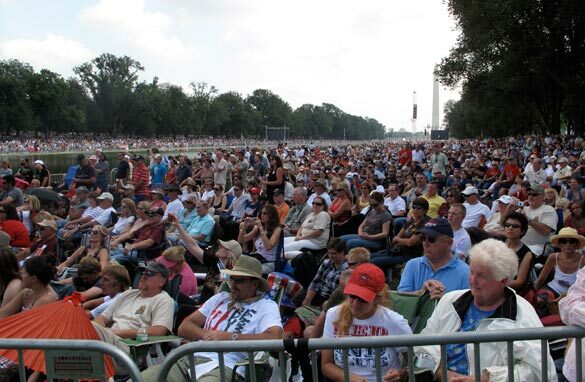 Glenn Beck joked at the August 28th “Restoring Honor” rally that he had “…just gotten word from the media that there is over 1,000 people here today.” Later, he offered estimates of 300-500,000 attendees. Mass media reports were all over the place, from CBS’s estimate of 87,000 up to a few hundred thousand in other mainstream sources, including The New York Times and NBC News. Of course, this isn’t incredibly precise. People come and go at large rallies, particularly longer ones, and they may be huddling together to hear a speech, dancing, or sitting on lawn chairs. Do high school and college students take up less space than older, uh, more substantial (?) people? I can’t remember seeing so many chairs at any demonstration I’ve attended in the past. Maybe it’s the crowd, or maybe, as sociologist Bob Edwards suggests, it’s better lawn chairs. You can count buses or hotel rooms. Indeed, a hotel clerk in Washington, DC told me that the entire city was sold out for the Friday before the rally, and hoteliers were honoring the demand by charging exceptionally high rates. But some crowds are more likely to camp out on friends’ floors and pack the hotel rooms than others. I’d expect that younger (poorer) people are more likely to take the overnight bus from New York or Boston than to come in the night before. Steven Doig, a journalism professor who consulted for CBS, explains the methods and the controversies on his blog. The basic story is that people who stage the event are unhappy and untrusting when he finds fewer people than they announced. Alas, such witness testimony tends to be based on faith, rather than fact–not always a big problem for the committed. This entry was posted in Uncategorized and tagged demonstrations, Glenn Beck, numbers, tea party. Bookmark the permalink.